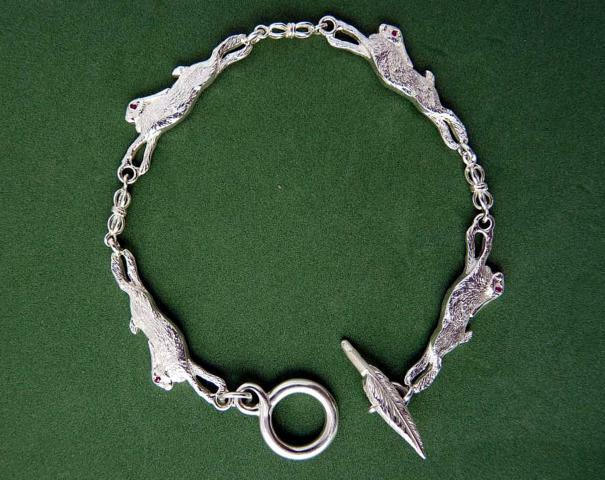 Hares have always captured the imagination and somehow a silver hare bracelet seems almost to be a good luck charm here is one with four hares running flat out. Four brown hares, all running flat out across a field – the animals are slightly curved to fit the wrist perfectly and they have ruby eyes. This bracelet joins at the ends with a feather going through a silver figure of eight ring.